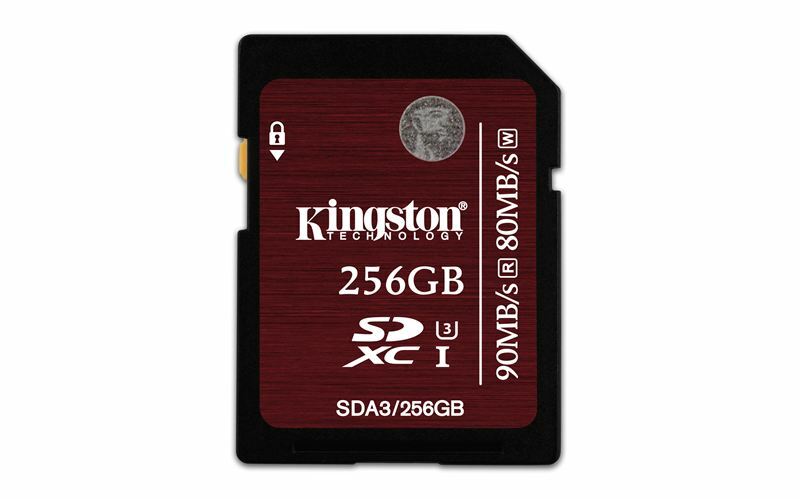 30 – June, 2015 -- Kingston Digital Europe Co LLP, an affiliate of Kingston Technology Company Inc., the independent world leader in memory products, today announced the addition of 128GB and 256GB capacities to its line of SDHC/SDXC UHS-I Speed Class 3 (U3) cards. The UHS-I U3 (Ultra High-Speed Bus, Speed Class 3) specification guarantees performance of at least 30MB/s read and write, and enough bandwidth to record and playback 4K video without interruption. Kingston’s SDHC/SDXC UHS-I Speed Class 3 card provides speeds of 90MB/s read and 80MB/s write, which is up to 9x faster (read) and up to 8x faster (write) than standard Class 10 SD cards. The faster speeds ensure the best video and photo integrity by reducing stutter as well as faster PC upload time, especially when using USB 3.0 card readers. The higher-capacity cards are ideal for Digital Single Lens Reflex (D-SLR), Digital Single Lens Mirrorless (D- SLM) cameras, camcorders and video cameras. They allows users to capture larger high-definition files including Full HD (1080p), Ultra HD (2160p), 3D, and 4K2K videos. In addition to 4K video capture, they can also be used for high-density photography in burst or continuous capture mode. SDHC/SDXC UHS-I Speed Class 3 is backed by a lifetime warranty and free technical support. For more information, visit kingston.com/us/flash/sd_cards.